DRIVERS – Daniel RICCIARDO (Red Bull Racing), Fernando ALONSO (McLaren), Lewis HAMILTON (Mercedes), Romain GROSJEAN (Haas). Q: Lewis, we’re going to start with you. You’ve been hugely successful here in the past and it looks like they’ve had you busy here as well this week, so just talk us through what you’ve been up to in New York this week? Lewis HAMILTON: It’s just been the normal promotion stuff. I was there with IWC and with the team at the NASDAQ conference that we had… and then a bunch of other TV stuff I just did. Q: Well, America seems to be a place you have quite an affinity with, and you’ve won the last four races here, as well as the Drivers’ title in 2015. Does it feel like it’s all coming together again for a repeat this weekend? LH: Not particularly, no. It just feels like another race weekend we have, and we want to win, so it’s a simple goal for us, we just arrive to try and do the same thing. The weather is up and down and our goal is really just to perform as we have in previous races, we’re not thinking about it in any other way. Q: Thank you. Fernando, you’ve got a huge following here in America after your Indycar exploits, but how special will this final US race in Formula 1 be for you this weekend? Fernando ALONSO: Yeah, it’s always special racing here, with all the fans. Hopefully we’ll have a good show on the weekend. As Lewis said, the weather is a bit up and down on Friday and Saturday especially, hopefully that will mix things a little bit and we’ll see a good race on Sunday. In our case I think we different targets, to try to score points after two races out of the points. It’s going to be challenging but we’ll try. Q: You’ve spent a fair bit of time in America this year. Will you be spending even more time here next year? Can you tell us anything about your 2019 plans? FA: Yeah, I don’t have 21 races in F1 to travel around to, so with more free time I will come to the States… for a holiday. A little bit more. Q: How about from a racing perspective? FA: Let’s see. As I said many times, the Indy 500 is still very attractive, as it was last year, and after winning Le Mans this year, it’s even more attractive to try to achieve it in the short term. Still working on plans for next year and as soon as they are finalised you will know. Q: Daniel, you also seem to really enjoy it over here. We’ve seen you’ve been at a Longhorns game this weekend. Is this one of your favourite events of the season? Daniel RICCIARDO: Yeah, it is. I love it. I don’t know, I’ve always enjoyed coming here. The football was a really cool experience. It’s amazing how many people go to a college game, how the capacity is that alone. It’s cool to experience new things and yeah, I’ve had a good week! Q: Well, this season you’ve had two race victories but no podiums alongside that. Is it realistic to expect you to change that record here this weekend. DR: Yeah, I think so. I think we’ll have a decent car around here. It’s weird, yeah I know, that I haven’t had any actual podiums. So yeah, we’ll try to make it happen. Last year I was going pretty strong in the race but then we had to stop with some mechanicals. It’s definitely a fun track to race on. I enjoy Austin alone, but the circuit as well is really good for racing. You can overtake and it’s pretty unique, so I’m happy if it’s kind of wet for Friday and Saturday but I kind of feel if the race is dry Sunday it will still be pretty exciting. Q: Thank you. 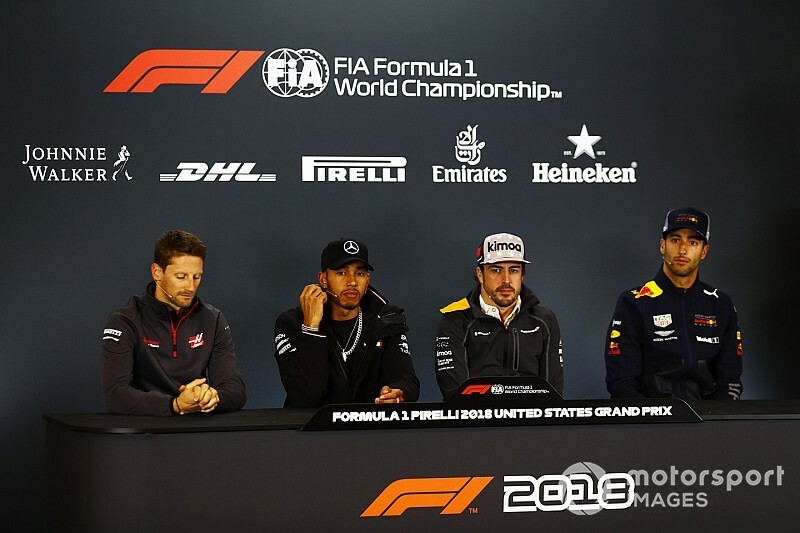 Romain, we’ve talked about the affinity these guys have with America, but it’s a home race for Haas, and you’ve got just four races left to try to overhaul Renault in the Constructors’ Championship. So us there a lot of pressure on this weekend? Romain GROSJEAN: I think the pressure is always on, to be fair. Different levels, obviously for the top guys to win the championship, and for us to go and try to get Renault in the Constructors’. It’s a great weekend, it’s going to be very busy, a lot of marketing commitments, but I think it’s a good that we’re here, racing here for an American team and coming this year with a competitive car compared to the first two years us great. Q: If I could just ask you about your own form. You had a tough start to the season, but then I think you scored 31 points in the last nine races. Just how did you go about turning that around? RG: Thirty-nine. I got eight stolen in Monza. DR: He’s not still bitter! RG: No, I think everything is going great since Germany. It was a rough start to the season and things didn’t go my way. A bit of bad luck and bit of mistakes and all together it makes like a snowball effect. At one point I managed to stop that and come back to where I wanted to be. I’m really enjoying driving the car. I think we’ve had some really good races and I’m looking forward to the four last ones and here especially. Q: (Christian Menath – Motorsport-Magazin.com) Lewis, I know you’re not looking at the championship all the time, but if we would do an overlay from last years championship to this year’s championship it was pretty tight all season but then after the summer break the car and you personally, you really kicked off. Is this just a coincidence or is there anything – that you are understanding the tyres better, the team is understanding the car better? What is your explanation for that? LH: Yeah, it’s probably just a coincidence that it’s exactly the same but we are improving the car the whole year long. We are improving our knowledge of the car and how to get the most out of it. If we knew what we knew in the second half we would do a lot better at the beginning. That’s just how it is in the sport. That’s how it always is. It’s been the same since I started in 2007. I think it’s probably the same for everyone. Not really much more else to say. Q: (Dieter Rencken – Racing Lines, Racefans.net) For all of you, though Fernando I know this doesn’t really affect you for next year. The 2019 regulations state that the drivers weighing under 80 kilos will be ballasted up to 80 kilos, that ballast to be carried within the sort of cockpit area. How do you feel about that? Is that correct or should drivers be allowed to take advantage of their physique, as they can in other sporting activities? DR: I personally feel that they are just getting us prepared for more races in America. DR: All of us will enjoy our food a little more! I’m not complaining about it. It’s not like we’re going to, let’s say, take the piss, it’s more just a lot of us now tend to starve ourselves on race weekends and even training we can’t really do much strength training because we would just put on mass. I think it will just allow us to train harder, eat harder… Eat harder? Eat more. But it’s not like we’re going to have beer bellies or anything, we’re just going to be stronger and I think that’s only a good thing. LH: I disagree. I think there are going to be some people with bigger bellies. DR: Well, the small guys can afford to do everything! Q: Romain, your thoughts on the weight? RG: I think it’s a great thing. I’ve been the same as… Daniel and Lewis are quite tall. I think it hasn’t been great to starve ourselves and not eat as want to, so a few kilos of margin is going to be great. It will be a challenge for the team, because getting to the minimum weight for the regulation with the 80 kilos for seat and driver together is going to be tricky, but on the other hand it’s going to make our lives an awful lot better. LH: I think it’s great. It’s definitely going to open the doors up for people like Will Ferrell and all those who weigh a lot more to come in! It’s always been something we’ve all worked hard to keep in shape and it has been something we’ve worked really hard at; to make sure we’re not overweight. I guess we can eat more pancakes. I think we will prepare more and we can all be a little bit stronger next year. I guess for the people who are struggling to come under the weight; for example there are some of the taller drivers who struggle to be less than 80 kilos. I guess it doesn’t really make much difference for them otherwise. Q: Fernando, you won’t be racing here next year, but you have raced in other categories where weight balances are different. Do you think this is a good move for Formula 1? FA: Yeah, I think it is. In Formula 1, I’m obviously not one of the tallest, so it’s more a question for the tall guys and I think it’s fair for everyone, so I think it’s good. In other series, in WEC in particular, where the weight is free, that normally gives and advantage to the lighter and smaller guys, and probably that is unfair in a way, so I think Formula 1 is doing great on that. DR: I caught it, it’s alright. LH: I noticed. No one else watched Talladega Nights. Ricky Bobby. No? Overweight NASCAR driver. NASCAR drivers can now come over to Formula 1, which is cool. Q: (Scott Mitchell – Autosport) Daniel, we know you’ve not had the smoothest season, you’ve talked about that before. Your 2019 team, Renault, hasn’t had the smoothest end to the year either: they’ve been quite honest about falling behind on the engine side and the car side. That situation’s changed, obviously, since you agreed to join them. How much of a concern has it been watching their performance, and how encouraging is it to hear they’re planning an all-new engine for next year? DR: It’s encouraging, obviously. When I signed, I knew that there was work ahead but I know that they’re putting a lot of effort into making things better and expanding a lot of departments and trying to make ’19 stronger and ’20 and whatever. Yeah, the way the last few races have been this year, obviously, it would be nice to see them improve every race and whatever but I honestly don’t look into it too much yet. I think ’19 is a new car and it’s going to be a fresh start again, so I’m not spending too much energy on that at the moment. Obviously, all I can do is, once my year’s done is try to be fully immersed into it all and try to help as much as I can and see how things go from there. Q: (Jon Massengale – Speed City) We’ve got a lot of American fans excited about the Haas F1 team, the momentum they have coming into Austin for good points – but all four of you up there talk about excited to race in the United States. I want to ask, what can we do to continue the momentum to grow the sport here in the United States? RG: Well, I think, to me the obviously, answer is to get more races in the US. I think most of the time it’s really hard for the audience to watch the grands prix, it’s the middle of the night. It’s not easy to grow the fan base. I think more races in the US. I think races a bit more exiting as well. If you look at NASCAR, you never know who’s going to win the race. In Formula One I can tell you it’s going to be the Mercedes or Ferrari winning on Sunday. I think that could be improved – but definitely more races in the US to get closer to the fans would be the first thing. Lewis, your thoughts on how we can grow it here? LH: I agree with what he said. We do have the one race and this is a big, big country with a lot of sporting heritage. They love intensely-fought games but also have something to look forward to – because there’s a build-up to multiple games. We only have that one race here, so the people, for example in this city or people in the close States that fly over for this one grand prix, which happens once a year, it’s like a festival. You can’t really get too excited about one festival in a season. So, that’s probably something that Liberty will be working on for the future. FA: More or less the same. Try to get more races here, hopefully one American driver into F1 soon, and that will help. I think it will take a little bit of interest into the sport and have a little bit more unpredictable races is more or less what they have here. To have people expecting the unexpected until the end. And Daniel, your thoughts on growing the sport here. DR: I have to agree with all that. Currently they don’t have an American driver. We can do our best to put on an accent and fill those boots. [Approximation of Texan accent] I can try all I can – I don’t know how these boys can do it but I’ll give it a red-hot crack and see how we go. DR: It was only a matter of time! Q: (Andrew Benson – BBC Sport) Lewis, what’s your explanation for how you’ve taken off, collectively, since the summer break. Is it just stepping forward with the car? Is it personally? Is it mistakes from the opposition? What is it? What’s the biggest factor do you think? LH: I haven’t really thought about it much. It’s a combination of so many things. Naturally, as a driver, you do improve. Or, at least, I’ve noticed in myself, I can’t speak for everyone – but I’ve noticed I improve throughout the year. How you conduct yourself, how you perform within the team, how you’re able to maximise in the car. If you go back through all the years, you know I always say that by the second half of the season I should be better, and most of the time that’s usually the case. I think also, as a team, we’ve collectively done a better job in every area. And then, the other side, for sure, has not done as good a job in that respect, coming into the second phase. So, I don’t really have a massive explanation for it. My knowledge is as good as yours in that sense. Q: (Ben Hunt – The Sun) Lewis, you said you’re concentrating one race at a time – but you do stand on the brink of winning a fifth World Championship. What does that mean to you, were you to do that this weekend here in Austin? LH: Again, really as a team, none of us are saying how cool it would be if it happened this weekend or the next, we’re not focussing on ifs. We’re focussing on making sure that we deliver. There’s still 100 points available. We can just never be complacent in life, and in a Championship as intense as this. We expect Ferrari to punch back hard here this weekend, so we can’t be relaxed in any way, shape or form. We’ve got to make sure we come here and raise the bar again. So, I’m definitely not thinking this weekend, how’s it going to feel if we do the job. Because I’ve got to do the job and that just adds more pressure and you just don’t need more pressure. So, focussing on making sure that I drive the best that I’ve driven all year long and we get the car where we need to get it. It’s going to be wet, I think, all day tomorrow, as far as I’ve heard, and potentially on Saturday, so it’s going to be a tricky weekend. So, nothing is a given. Q: (Jim Vertuno – AP) Lewis, given that this season has been a chase for a fifth championship, what does the name Fangio mean to you, his place in history and can you imagine yourself trying to drive the cars he muscled around the track back in his era? LH: Imaging myself driving some of those cars back then? I have driven some of those cars. Stirling Moss’s car I’ve had a go in, some of the Silver Arrows they had, around the old Monza circuit, for example, with Sir Stirling, which is pretty intense. It’s always really strange to hear the drivers’ mental philosophy back then. Sir Stirling would say you’d want to fall out if the car’s going to crash: you hope that you get thrown out the car. It’s a much more confined space for us. It’s all about being stuck in and being safe. I would have… I don’t know if the 50s was a particularly good time, wasn’t a great time for black people either, so probably wouldn’t have been racing back then, but I’m grateful to be in this era and with the technology that we have and seeing the cars advance. I’m so grateful to be part of this era. Fangio is always… he’s like the godfather of the drivers’ sport for us. He’s the godfather for us, one of the greats from the beginning and will always be admired in the sport. It is crazy to think that I’m embarking on a similar number of championships that he had. Q: (Phil Duncan – PA) Fernando, just on Lewis, when you first met him in 2007, did you think this guy would have the credentials to go on and match Fangio, win five titles and all the races? And Lewis, we saw you issued a post in Instagram, just defending Sebastian. Do you think his criticism has been a bit unjust this year? FA: Well, probably at that time it was difficult to image what the future could bring for Lewis, and for any of the guys on the grid. But yeah, definitely, he had showed the talent from day one, and fighting for the Championship in his rookie year, winning in 2008. Probably at that time, we all agree that five or seven World Championships will be possible. Then, obviously, was a little bit down due to the performance of the car for a couple of years. And then, yeah, switching to Mercedes at that time, we all were thinking that maybe was not positive – because at that time Mercedes was struggling in 2013, and things like that. So, it’s up and down, the feelings. I’m happy for him because he showed the talent from day one. He was able to win races when the car was there to win it but he was able to win races in some of the seasons when the car was not in the top of the form, like 2009 and things like that, he’s still winning a couple of grand prix a year. It’s impressive – and now it’s time to enjoy for him, so I’m happy. And Lewis, your comments defending Sebastian after Japan? LH: I think if I was in the same position they would probably do the same thing so it’s more as drivers we are all members of the GPDA and I think we all just need to stick together and I think the respect that we have for one another I think is probably the greatest that it’s been for many years. At least in the years that I’ve been in Formula One. I think ultimately as a four-time World Champion, it is the most intense year that we’ve had. So every hiccup is magnified, naturally, as it is perhaps in any sport at the top. But there have been many – or several – times that I’ve been in the firing range and Seb’s always been really respectful and supported me, so I thought it was only just to do the same. 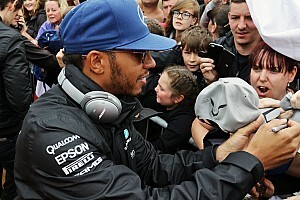 Q: (Frederic Ferret – L’Equipe) Two questions, the first for Lewis. Can you explain to us why you do love America so much? And the second one for Fernando; can you give us your top five of the World Champions and what does it mean for you to have one driver equalling Fangio with five titles? LH: I don’t know if I love it more than everyone else loves it. So many people come out here and… I grew up watching… movies are something I’m massively into… grew up watching these great movies which were filmed here in the States and then dreaming, as a kid, of one day coming to the States: I think it wasn’t until I was 17 and I finally went to New York and loved it and the more and more time I spend out here the more I enjoy it. I love the big roads they have, they do everything generally bigger and better in most cases. They’ve just got some great cities, good energy, good people, music is the centre of the universe for entertainment here so there’s many many reasons. The food is great, they’ve got the best pancakes out here. FA: I guess it’s difficult to do the top five. FA: Not really! Probably Michael, Fangio, Senna, Prost, Lewis, probably this will be the top five, probably, that come to my mind but it’s difficult to compare different times and different ways to win those championships. Lewis winning five now and being the same as Fangio, as I said before, it’s a great achievement and if one had to do that in our generation, I’m happy that it’s Lewis because he showed the talent and he showed the commitment, as I said before, when the car was dominating he delivers and won the championship. When the car was not good enough to win the championship, he still put in some performances to show his talent and that’s difficult to see in our days. Q: (Dieter Rencken – Racing Lines, Racefans.net) Fernando’s already been to Indianapolis but when we as a motor sport of community think of the US we generally think of the Indianapolis 500. A lot of Formula One World Champions, race winners etc have actually raced at Indianapolis. Could you imagine yourselves ever racing there? DR: Yes and no. The thought of it sounds good. Ovals creep me out a little bit. I won’t lie. It would be cool. I don’t know. I would at least like to have a go, like maybe just a test. Let’s see how things go but yeah, it was cool watching Fernando do it, don’t get me wrong and part of me was like trying to picture myself being there and doing it but yeah, maybe one day. At the moment I don’t say it’s something I’m looking to do in the near future. I don’t know. Probably the older I get, the more scared I’ll become, so if it doesn’t happen now maybe it won’t ever happen. I don’t know. DR: Who thought turning left could be so hard? LH: I kind of feel in a similar way. I would definitely like to try it as I’ve never really driven an oval before and the cars are incredibly fast and (I) always want to go faster. I probably will get a chance to have a go. I’m sure if I wanted to have a go I could but it’s never been a series - naturally, growing up in Europe, it’s never been a series that you grew up aspiring to be in, it was always Formula One being it was the highest technology and has always been – at least growing up – the thought was that it was the highest grade of drivers that you wanted to compete against but they’ve got some great drivers there as well. I think I would prefer to try NASCAR. Watkins Glen, I’ve always wanted to have a go up there, beer cans in the side. I have driven a NASCAR years ago at Watkins Glen which was awesome so that’s something I could do potentially. I honestly have no desire to do any other racing beyond Formula One if I’m really honest but maybe that will change when you do stop, because you do it your whole life and temptation is always going to be there, I’m always going to be a racing driver at heart. FA: Well, they need to commit to the race. I think if they just want to do a test they will never do the race after testing the car, because it feels quite bad. It feels quite difficult. The car is self-steering to the left, you go on the straights and you are turning right and it feels very weird to drive the car, but then in the race it is just a different thing. You wake up your competitive instinct and you forget about all these weird things that those cars have and it’s a lot of fun. It’s part of history. I think the biggest thing is to go out of your comfort zone and drive something that you don’t feel ready to handle, ready to control and that adrenaline is magic. Q: (Craig Slater – Sky Sports) To the two World Champions, Lewis and Fernando: there’s been a lot of attention on Mick Schumacher winning his Formula Three series. I wonder how you feel about him progressing into F1, one being whether the Schumacher name will be an asset or a burden to him? LH: I don’t think it will be a burden. I think naturally for any of the champions when they have youngsters come through, naturally Michael is named the greatest driver of all time, he’s got the most titles, so there will one hundred percent be a Schumacher back in Formula One, partly because of the name, but secondly because he’s doing a great job. He’s obviously got a lot of talent as his Dad had, just like Keke and Nico, just like when Fernando has kids I’m sure an Alonso will be here again. Even if I have a kid who wants to race and even if he’s no good he can make it Formula One because of the name. But no, he’s doing a really great job and he’s a really great kid as well. He’s come to… and been a part of our team a couple of weekends, I think it was last year, very attentative. He’s got a great talent as his Dad had so I don’t think it will be a burden in my personal opinion. I think it could be great for the sport. FA: Not much to add. I don’t know him. Obviously I never met him, probably. You only see the results from the outside and he has a great talent and he will be good for the sport, to have the Schumacher name again in F1. Let’s see what the future brings, not putting extra pressure on him which I’m sure he has enough already. Let time decide. Q: (Chris Bils – Austin American Statesman) Lewis, you’ve had so much success here and really your name has become synonymous with this track. Is there anything in particular, over the years, besides winning that you’ve enjoyed about coming here and also you were talking about the food, pancakes, is there anything that you like to eat while you’re here? LH: They don’t make tracks really like they did in the olden days. The older circuits that you’d go to, you’d dream of going to, watching the legends drive there, so some of the new tracks aren’t really that good but this is one of those that is, it’s got great character and from day one when we arrived here, there was a massive crowd that came who I’m sure, at least half of them, probably were new to the sport which was great so it had the impact it was meant to have and I think every year it’s kind of been growing but just driving the track is a massive challenge and also you can actually race here, you can follow which is one of the downfalls of some of the circuits: it’s harder to follow. So I think that’s really why I’ve enjoyed it a lot because I’ve had the chance to have races here, real races and obviously there is that great sporting heritage here and people are genuinely super enthusiastic about sports, no matter which sport it is. And the last race here that we had, the whole spectacle, I think, was probably the best of the whole year, the whole build-up and everything I thought was great. It’s great to celebrate the culture wherever you go. I think there was negativity I think I heard after the race about how American it was but I was like ‘we’re in America, we’ve got celebrate America at this Grand Prix particularly’ and I think that should happen in all the countries we go to. Food-wise, I grew up… for a period of time I lived on an American airbase in England and chicken wings… this guy my Mum was dating did the best chicken wings ever and I used to come out here and have that but I don’t eat chicken any more, being as I’m on a plant-base diet so I don’t know how that’s going to go while I’m here, I might be living on pancakes all weekend but I don’t mind that.